The climate in the Nile basin results from atmospheric patterns of air, heat, and moisture circulation that vary over time and space, and the interaction of these atmospheric patterns with the landscape. General atmospheric circulation patterns include convergence and rising of air in the equatorial region, movement of air towards the poles high in the atmosphere, downward movement of air near 30º latitude north or south of the equator, and movement of air back towards the equator. Near the equator, intense solar radiation and the convergence of the warm, moist trade winds cause air to rise, carrying heat and moisture into the atmosphere (1). As the air masses become trapped between the stratosphere above and the air moving upward from beneath, they are forced to move either north or south toward the poles (2a, 2b). The air masses lose heat as they move poleward, and begin to descend at about 30º latitude north or south of the equator (3). As the air masses spread out over the surface of the earth, air flows back towards the equator as the trade winds (4). 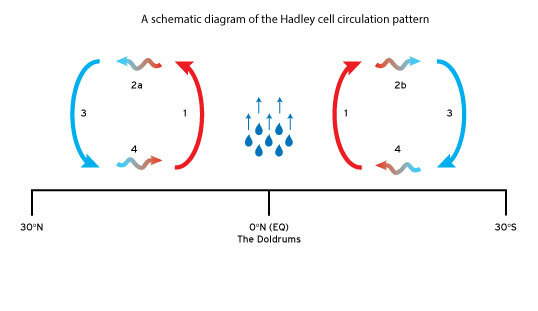 This generalized circuit is known as the Hadley cell circulation. The intensity, geographical extent, and latitudinal position of these patterns can vary seasonally. • The air masses lose heat as they move pole ward, and begin to descend at about 30º latitude north or south of the equator. • As the air masses spread out over the surface of the earth, air flows back towards the equator as the trade winds. The Intertropical Convergence Zone, or ITCZ, is the region encircling the earth between the Hadley cells of the northern and southern hemisphere. The ITCZ is formed by the convergence of the trade winds, which flow towards the equator as part of the Hadley cell circulation pattern, and is characterized by rising air masses and low pressure. The convergence and rising of warm, moist air masses into the atmosphere is followed by condensation and cloud formation. Cloudiness and release of rainfall in a series of thunderstorms are the dominant climatic features of the ITCZ. Precipitation typically exhibits a diurnal pattern, where clouds form in the late morning and early afternoon, and lead to convectional thunderstorms and rainfall in the late afternoon. Due to the predominance of vertically rising air masses and lack of horizontal air movement, the ITCZ has been termed the “doldrums” by sailors. The ITCZ is also known as the Intertropical Front or the Equatorial Convergence Zone. The location of the ITCZ is not constant, but varies semiannually back and forth across the equator according to the sun’s zenith point. The movement of the ITCZ in response to the position of the sun is responsible for the rainy and dry seasons experienced in tropical latitudes. Droughts and flooding can result from longterm or extreme changes in the position of the ITCZ. The subtropical highs refer to areas of high pressure between 20º and 40º latitude, resulting from the downward movement of air masses. These high-pressure areas affect the climate of these latitudes, which is dominated by cloud-free and windless days. The size, intensity, and geographical position of the subtropical highs vary seasonally due to other seasonal atmospheric effects such as the movement of the ITCZ. Intense solar radiation and the convergence of the warm, moist trade winds cause air to rise, carrying heat and moisture into the atmosphere. • The air masses lose heat as they move poleward, and begin to descend at about 30º latitude north or south of the equator.